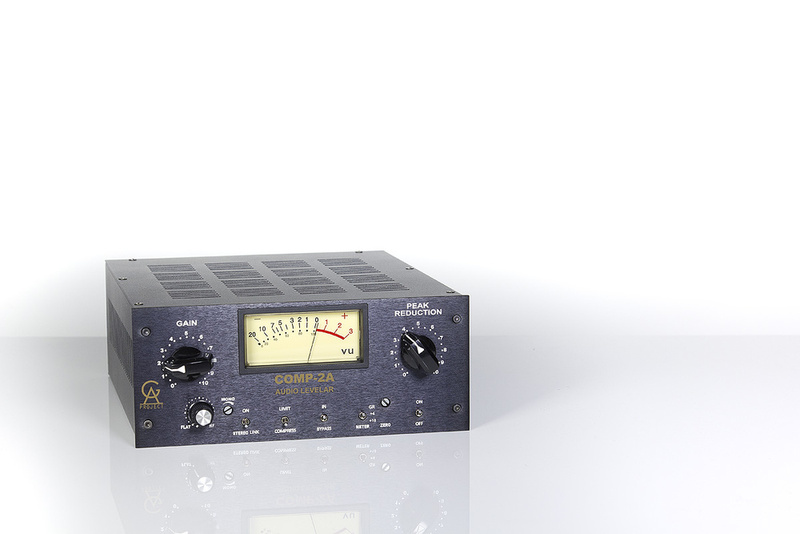 Announced at the same time as the Comp-3A solid-state optical compressor, which I reviewed back in SOS August 2016 (http://sosm.ag/ga-comp3a), Golden Age Project’s Comp-2A — which I’ve long been looking forward to trying out — has finally arrived. As the name implies, this is the company’s interpretation of the UREI Teletronix LA-2A, which remains one the of the most desirable vocal compressors around. As I explained in my Comp-3A review, the LA-3A (on which that model is based) and the LA-2A are very closely related. Their form factors differ: the LA-2A came in a chunky grey 3U chassis with a hinged front-panel, which opened to give service access, while the LA-3A was a more conventional half-rack 2U device. The other main difference is that the LA-2A, which was designed and released in the early 1960s by James F Lawrence II under the Teletronix brand, employed valve gain stages, whereas the LA-3A, which replaced it in 1969, used only solid-state electronics. The T4B optical cell — an electro-luminescent panel coupled with a pair of light-dependent (EL) resistors — forms the heart of both units, and is responsible for their similar, distinctive gain reduction. The surrounding circuitry affects both the general tonality (particularly when driven into distortion) and aspects of the gain reduction — in particular, this is why the attack in the LA-3A is marginally faster for large transients than in the LA-2A, making it sound a little brighter on some material. In these days of forums and social media, the LA-2A seems to have acquired a certain mystique, and if you spend long enough trawling through the comments, you’ll notice some very conflicting terms being used to describe it: some call it ‘aggressive’, others ‘smooth’, for example. I suspect the main cause of this apparent variance of opinion is that one person is talking predominantly about the gain-reduction behaviour at normal signal levels, while another is talking about the bright-sounding edginess of the harmonic distortion that can be stimulated when the LA-2A is fed ‘hot’ signals (by comparison, the distortion of the LA-3A tends to sound ‘warmer’, with more presence in the mid-range). So far, I’ve been discussing the UREI/Teletronix originals. But what of Golden Age’s interpretation? Well, in broad terms, it’s pretty much a faithful copy — but there are a couple of tiny tweaks, as we’ll see. When it comes to the aesthetics and ergonomics, Golden Age have eschewed the rack-hogging chassis of the original, and the externally mounted components on the rear panel. Instead, they’ve opted to fit everything inside the more humble form factor of the LA-3A. That’s a sensible decision which will not only have reduced the manufacturing cost (and thus the asking price), but means that the unit takes up less space in your studio and could be more convenient in a portable tracking setup. 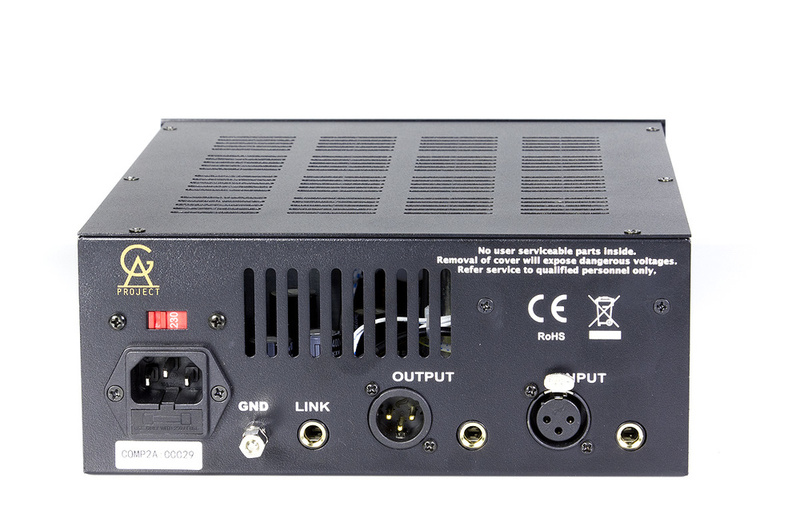 Still, if you’d prefer to see this in 19-inch rackmount form, it’s worth noting that Golden Age also supply a rackmounting kit which can accommodate two GA-2A or GA-3A compressors. Importantly, there’s still more than enough room for your fingers to grab and tweak the controls. Built with mods in mind: in addition to the four vacuum tubes, there’s a spare socket to accommodate the 6AQ5 used in the original.Of course, the device needs a little more space than the Comp-3A did, given the presence of four full-sized vacuum tubes — not only are these larger than the solid-state electronics, but they require better ventilation, and there’s also a spare valve socket (of which more later). Therefore, the unit extends back quite some way from the front panel. In the signal path, the Comp-2A employs two tubes: a 12AX7 dual-triode amplifier, and a 6N6 cathode-follower, both of which are dual-triode types. In the side-chain circuitry are two more tubes — another 12AX7 and a 6P1 tetrode, the latter driving the T4B’s EL panel. All the factory tubes, each of which is protected by its individual metal shield, are unbranded Chinese types. It’s possible that you might lower the noise a little or get a smidgeon closer to 100-percent LA-2A authenticity by replacing these with more esoteric, more expensive tubes. Clearly conscious of the trend for modding and upgrading components, Golden Age have included an additional tube socket which can accommodate the 6AQ5 pentode used in the UREI/Teletronix version — you can remove the factory 6P1 tube and install one of those. And the 6N6 can, if you wish, be replaced with a 12BH7 too, as in the Teletronix unit — you just swap them and change the internal jumper setting. While all this perhaps makes this device a modder’s dream, the factory tubes appear to have been carefully selected; they function perfectly well and sounded good to this reviewer’s ears. 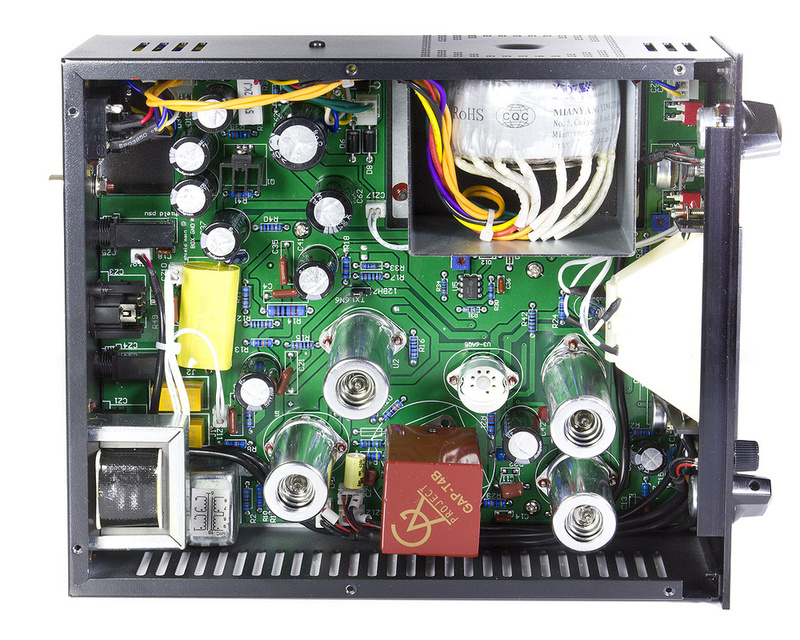 The tubes are joined by audio input and output transformers which, in common with those in most Golden Age products, are unbranded. Again, while authenticity hunters might consider ‘upgrading’ these, they trigger no complaints from me. If you open up the unit, you’ll also see the same Golden Age GAP-T4B opto cell used in the Comp-3A, which is built around a long-life EL panel and a matched pair of Silonex NSL5910 light-dependent resistors (one for the gain circuitry, one to drive the meter — the latter via an IC, in a small but sensible concession to modernity!). All of this is neatly laid out on a single PCB that occupies almost all of the chassis floor. 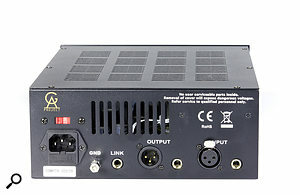 The analogue I/O are duplicated on XLR and TRS jacks.On the rear panel, the balanced XLR audio input and output are duplicated on TRS jacks. The dedicated grounding point of the original is present and correct (if not so much of a necessity these days!) and a further jack socket caters for stereo linking as on the Comp-3A. The power inlet is different from the other Golden Age units I’ve seen, which have tended to use an external 24V AC PSU, and that’s presumably due to the requirements of the tube-based circuitry — the device accepts 115 or 230 V mains AC via an IEC inlet, which must be switched to the appropriate voltage before plugging in. Power internally is derived from a chunky toroidal mains transformer. Despite the relative compactness, the front panel will be immediately familiar to anyone who’s ever used an LA-2A, be it hardware or a plug-in emulation. The panel is dominated by a large VU meter, which can be set to GR (gain reduction) or output level (+4 or +10 dB) and can be calibrated using a recessed trim pot, and by the chicken-head Gain and Peak Reduction knobs. Beneath all this are a side-chain filter, which runs from flat when set fully anti-clockwise to a chunky HF boost in the opposite direction. The effect of turning this knob clockwise is not dissimilar to applying a high-pass filter to the side-chain, in that it reduces sensitivity to those energetic low frequencies and makes it more responsive to mids and high frequencies. The Stereo Link facility can be engaged here via a toggle switch, and a further recessed trim pot allows you to determine the mix of the side-chain control voltages of each linked unit. Finally, we have a Limit/Compress toggle switch, and another to switch the compressor in or to bypass it. Operation is as simple as feeding the Comp-2A a sensible level signal, and turning the Peak Reduction knob until you achieve the desired amount of gain reduction. Then you use the Gain knob to bring the overall level back up and you’re done, as the attack and release times are programme-dependent. One notable characteristic of all T4B-based designs, including this one, is that the release time becomes longer the longer the input signal has exceeded the threshold — it can take as long as five seconds for the needle to return to 0 after a long period of heavy compression! To test the GA-2A, I used it on a couple of tracking sessions for vocals, and in a mix, as well as running a few pre-recorded sources through it that I generally use when testing gear. Not having to hand an original LA-2A, I decided to pit it against the best software emulations I could find (which I have previously compared with ‘the real thing’) — Universal Audio’s latest emulations for their UAD DSP platform. Like them, the GA-2A in general sounds classy and smooth, with effortless and almost ‘natural’ control of levels. And when feeding a hot signal in and crushing the bejeezus out of it, a similar character comes to the fore — so those no-name tubes and transformers can’t be all that bad! The behaviours when switched to Limit mode and when tweaking the side-chain EQ were also similar. Being honest, these tests reminded me just how good UA’s emulations of their own gear are now — they sound great and I have absolutely no qualms about using them for mixing. Still, subjectively, I slightly preferred the sound of the GA-2A. But I much preferred the tactile experience of using the GA-2A: I find using hardware feels much more immediate, particularly when tracking, than trying to compress using a plug-in; juggling controls like these is so effortless compared with a mouse or rotary encoders! There are those who’ll tell you that you no longer need to compress ‘on the way in’, due to the headroom available in 24-bit converters. But personally, if I have a compressor I like the sound of and know will be fairly smooth-sounding, and a vocal (or, indeed, any other part) that I know will need controlling with compression sooner or later, I’d rather get at least half the job out of the way while recording — particularly if I think the subtle thickening effect of the transformers/tubes might be beneficial. It just leaves you with less to do later! As with the GA-3A, when I racked my brain for points of criticism, all I could come up with was a list of potential embellishments — a wet/dry mix control, for instance, would be useful given that I often like using this as a parallel vocal compressor. My only other observation is that it would be nice to see a proper manual, with full technical specs, join the (admittedly useful) two-sided A4 info sheet that’s found in the box. So, should you buy a Golden Age Project Comp-2A? No... you should buy two! OK, I write that half in jest, but for the money it really is that good. If you know you want an LA-2A-style hardware compressor and have the money available, I sincerely doubt that you’d regret investing in one (or a pair) of these. Not only does it behave and sound very much like the real thing, but the fussier amongst you are catered for by the ability to upgrade the stock tubes. It’s also stylish and, importantly, it seems to have been built to last. Recommended. In the hardware world, other than the various iterations of the Universal Audio/UREI/Teletronix LA-2A itself, the obvious competition comes from Warm Audio’s WA-2A and the Stam Audio SA-2A. There are countless DIY projects, too, such as the Drip Electronics LA-2A — though note that these aren’t ideal projects for DIY newbies, given the high voltages involved. Sounds great, and is as effortless in use as the original. Both looks and feels classy. More compact than an LA-2A. Hot on the heels of their LA-3A homage, Golden Age Project have delivered the tube-based equivalent. There may be subtle differences between this and the Teletronix unit that inspired it but it rocks nonetheless — particularly given the remarkably low price.